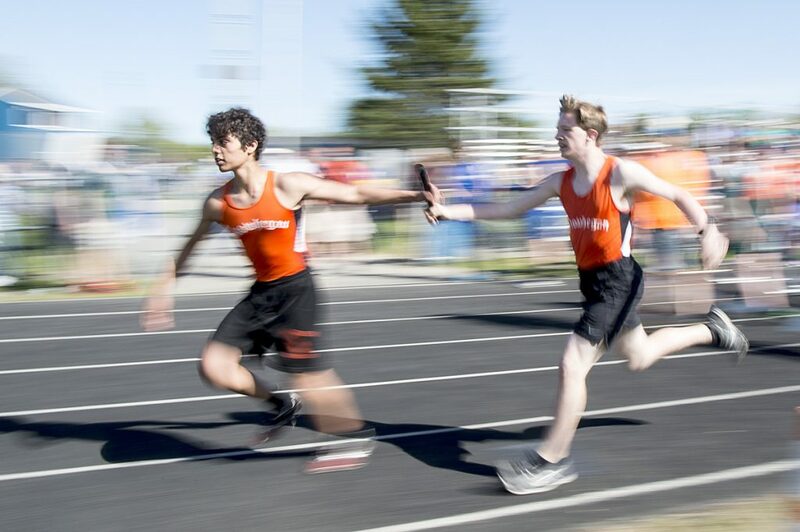 Plenty of state contenders get their throws in at track and field meet. FAIRFIELD — In the moments after her second discus throw at Friday’s Community Cup track and field meet, Shala Davis smiled a wry smile. It was a, I-know-I-can-do-better-than-that smile. A little later, on her last throw of the finals, she did. Davis threw 114 feet, 6 inches, winning what arguably was the most competitive event of the Community Cup meet. 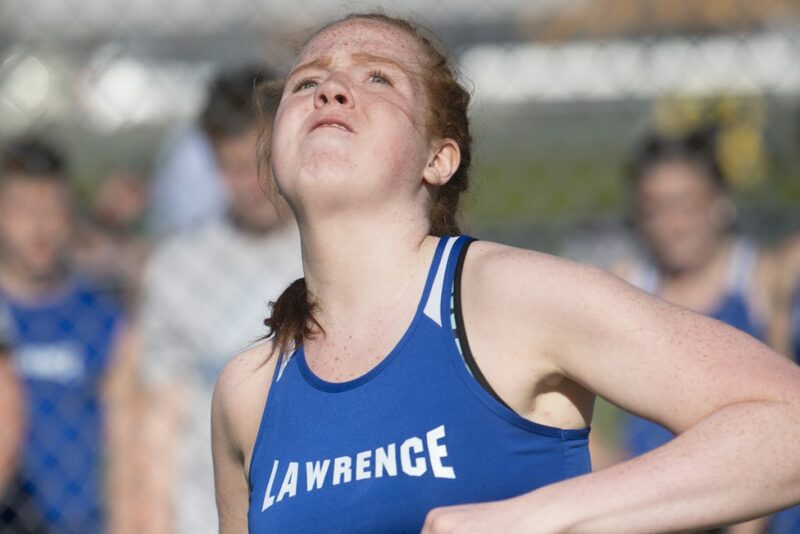 Six of the participants in the girls discus in the annual meet — which this season Lawrence High School hosted — have qualified for either the Class B or C state meet, and a handful of others are close. 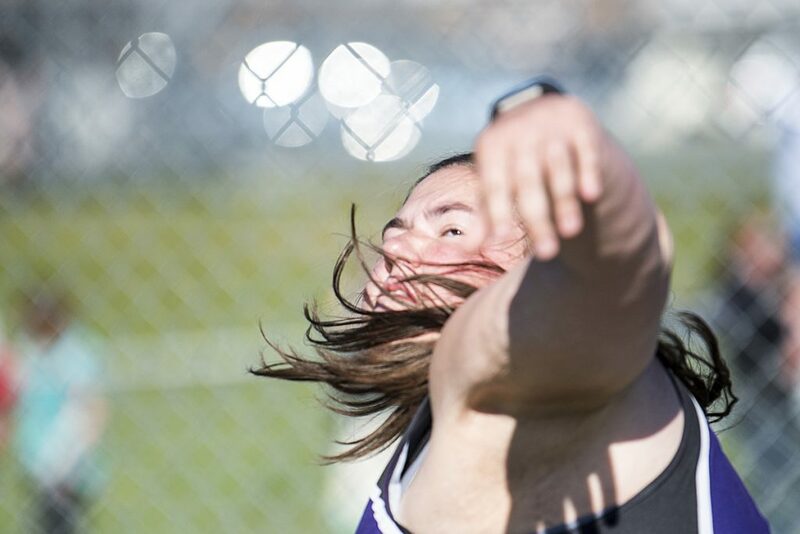 Along with Davis, the Waterville duo of Sarah Cox (113-4) and Corinne Rogers (101-3) each threw more than 100 feet, with throws that would have placed each in the top three at last year’s Class B state championship meet. Cox, last year’s state runner-up in the discus and shot put champion, and the top seed in the Community Cup, relished the competition. “It definitely gives you an extra push. I think when I have someone biting at my heals I throw better. It gets me angry. I think anger helps a lot, when you channel it into your throws,” Cox said. Lawrence junior Ainsley Day entered the meet seeded second, with a season-high throw of 107 feet, 9.5 inches. 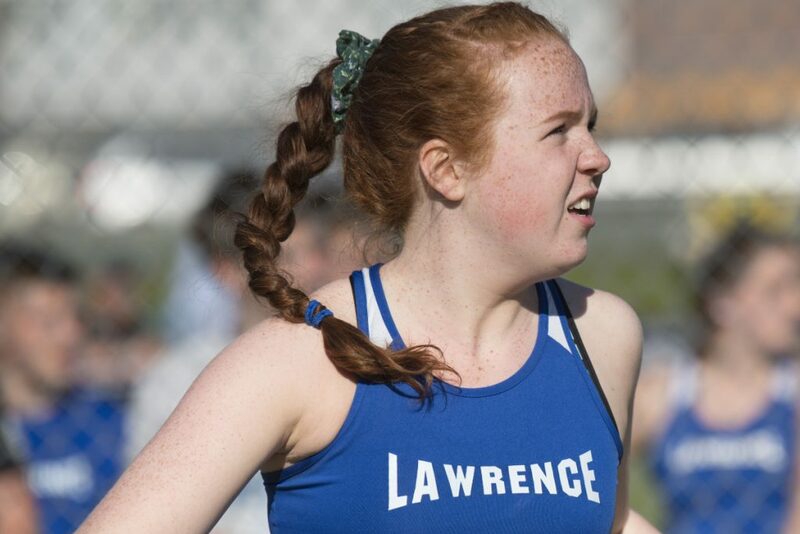 Considering the injuries Day suffered during the indoor track and field season, she was lucky to be competing at all. Early in the indoor season, Day suffered a concussion when she was struck by a shot thrown by a teammate. She recovered and returned to compete in one meet right before the Christmas break, but suffered another concussion in a car accident. That ended Day’s indoor season. In early March, Day was cleared by her doctor to resume workouts. She entered Friday’s meet ranked only behind Cox in Class B in the discus. “I’ve been working really hard to get to where I was last season. The success I’ve had, I’ve been happy with it because I didn’t think I would be here,” Day said. Day’s top throw on Friday was 92-7, and she fouled on four of her six attempts. Day attributed her throws to nerves. “I think I’m more nervous, as it showed today,” Day said. 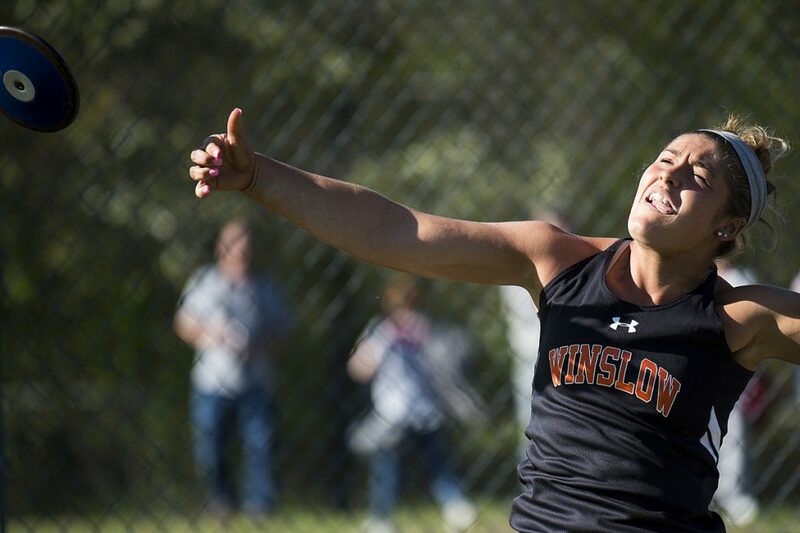 For Winslow’s Weslee Littlefield, the Community Cup was simply a chance to try to get better before the conference and state meets. Mt. Ararat in Topsham will host the Kennebec Valley Athletic Conference championships on May 26. Entering the day, Littlefield’s top throw of 99-5 had the junior ranked fifth in Class B. Throwing against Cox, Day and Davis is a good measuring stick, Littlefield said. While Cox, Day, Littlefield, Rogers and Waterville’s Jennasea Hubbard are looking forward to the Class B meet June 2 at Foxcroft Academy, Davis and Mount View will compete at the Class C state meet at Massabesic High School in Waterboro. With Friday’s throw, Davis moved ahead of Orono’s Lauren Melanson as the top discus thrower in Class C. Davis placed fourth at the Class B state meet last year. Her winning Community Cup throw was 16 1/2 feet better than her 98-foot toss at states. “I wasn’t as good as I am now,” Davis said. Like her second throw, that was another Davis understatement.